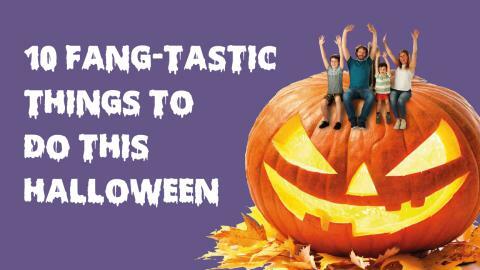 It's that time of year again, and there are plenty of fang-tastic activities around the region for families to enjoy. Have a look at our guide and see what takes your fancy! You can even save money with our Family Day Ticket - just £10 on the Go North East app or from your driver, and covers up to 2 adults and 3 children under 16. People aged 18 and under can also travel for £1 each way with our flat single fare. Halloween evenings at Beamish, now in their eighth year, are sure to give you a Halloween fright night you'll never forget. With The Town, Pit Village, Colliery Yard, Pockerley Old Hall and Waggonway swamped with petrifying creatures, only the brave will dare to knock on the doors to trick or treat. Feeling brave? Head for Life Science Centre and experience their 4D motion ride. Teenager Kevin and his bumbling dad have just accidentally woken Count Dracula from his coffin slumber; now they face a desperate dash to escape the castle before they both become lunch! Save money on the entry! One free child admission with a paying adult when you show your bus ticket (from the same day) at Science Centre reception. Do you dare take a trip on the Tanfield Ghost Train? Visit the Tanfield Railway for a spine tingling, hair-raising journey along the World's Oldest Railway. Gibside is made up of dark woodlands and plenty of hiding places for amazing creatures like spiders, bats, mice and frogs to live. This year's trail will take you on a journey to their favourite spots so you can see just how clever they really are and why they're essential in the world. Face your fears and discover an underwater world filled with predators and creepy creatures. You can test your nerve at the scare station - are you brave enough to put your hands in the mystery boxes? Will it be a trick or a treat? Save money on entry! £2 per person off the standard price when you show your bus ticket at the admission desk. Every day, the book experts curate a fine selection of ghoulish and spooky reading treats suitable for the whole family! Halloween fancy dress encouraged! Story times take place at 10.30am, 1pm and 3.30pm. Follow the trail to find spooky stories and treasures in the museum collections; from ghost ships to ancient bones! Find all the clues to claim a themed prize. £2.50 per entry (includes trail sheet and pencil). Help solve the curse of Harry the Spider on the spooky trail and have your face painted. Decorated heritage trains will be running during the day and on board, you'll be able to listen to spooky tales from the ghosts of Stephenson Railway Museum and play Halloween Bingo. Around the Museum, there'll be loads of activities... a witch hunt, spell making, crafts, storytelling and more.